As first Glastonburys go, DJ Shadow’s appearance at Worthy Farm last month didn’t have the most auspicious build up. Not only was he performing at a John Peel stage ankle deep in the worst kind of slop – not only did his headline slot coincide with Friday night’s single biggest downpour – but he was scheduled to play after Example, whose tooth-filled face intermittently appears under the Urban Dictionary’s entry for ‘talentless wanker’. As such, the majority of the mostly teenage audience stumbled their way through the mud and headed out into the rain – presumably to hunt down Ed Sheeran and pester him into a game of kiss chase – as Shadow’s crew began their pre-show preparations. Those that remained, however, quickly became transfixed by the strange apparatus being assembled on stage: the white sphere wheeled into the centre, the crosshair calibration of projectors beamed on to its curved surface like a Death Star amping up to destroy a small, diplomatic planet. By the time Shadow ambled on stage in his trademark cap and trimmed beard, the tent had once again filled with a sea of curious onlookers. He smiled and waved at the crowd like a geeky Great Oz before turning and stepping inside his god machine. The live show is known as the Shadowsphere, and the turntable impresario has been using it to wow audiences for over a year. 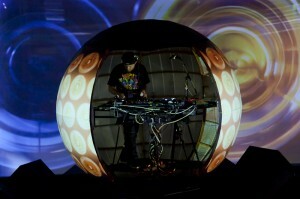 From inside the sphere, Shadow weaves a seamless collage of material from across his back catalogue and beyond, while on to its surface is projected a synchronised series of visuals that bend both the mind and the eye: from a cloudburst lighting storm coinciding with a DnB remix of Six Days to time lapse flowers celebrating the mournful string section of Stem. At various points the sphere turns into everything from a bouncing basketball to a frantically panning eyeball, a slowly rotating planet Earth and a mirrored marble rolling over the keys of a pipe organ (for Organ Donor, naturally). Shadow’s ability to entertain has never been in question, but he’s seldom been as intent on saturating the audience’s senses as he has in the Shadowsphere – his fourth major solo tour (not including the series of dates in 1997 that he cancelled due to the nightmarish production of the UNKLE album). As the venues have become larger, the sets more seamless and the visuals more spectacular, so the producer’s producer who made his name recycling vintage vinyl into abstract cinematic opuses seems to be slipping ever further under the sway of the ‘DJ’ half of his moniker. Not that he’s able to spontaneously wing it in ways that he might have growing up. Throwing on records to see how they go down is fine in front of crowds of between 300 to 800, but any more than that, he says, “and you’re dealing with a lot of disappointed people.” He recalls with a wince certain shows on the Hard Sell tour with Cut Chemist, an hour of 45-inch vintage vinyl juggling that bombed in front of festival audiences who couldn’t have cared less for the pair’s DJ purism. The Shadowsphere set is thus programmed for the most devastating mix imaginable; there’s no vinyl (major venue systems can’t deal with it), and no deviating from the pre-ordained sequence of tracks. But this is no mere display of audio and visual trickery: there remains a no-net live element to the show that means Shadow can still miss cues and fumble scratches. But despite regular appearances from the man himself thanks to a cut away section in the sphere – through which Shadow can be seen doing everything from scratching to banging out a solo on a MIDI drum kit – the biggest cheers of the night are reserved for tracks from Endtroducing…, the instrumental epic that turned both DJ Shadow and James Lavelle’s Mo’ Wax label into household names, and downtempo hip hop into the soundtrack for everything from after-school bong sessions to city boy dinner parties. 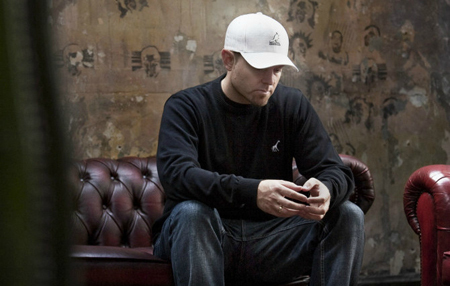 It’s also the album by which subsequent DJ Shadow releases have been judged, often with unrestrained vitriol: from 2002’s follow up The Private Press, on which Shadow reluctantly returned to sample-based mood music but struggled to achieve the otherworldly ambience of his debut, to 2006’s The Outsider, on which he threw caution to the wind and collaborated with a raft of Bay Area rappers extolling the virtues of hyphy – San Francisco’s indecipherable take on the crunk movement at that time putting Memphis on the hip hop map. If The Private Press had resulted in muted disappointment among fans of Endtroducing…, The Outsider led to unrestrained outrage: they gawped as Shadow tweaked his cap to one side and cavorted around with mumbling hoods like Keak Da Sneak, clearly oblivious to the fact that he’d been producing hip hop albums (including Paris’ Sleeping With The Enemy in 1992) long before he’d been making cinematic beats. Shadow was visibly rattled by the backlash, but defended his decision by insisting that constantly repeating the formula of Endtroducing… was not an option; he was moving forward, and it was time for his followers to decide whether they were ‘fans of the album or the artist’. It’s a stance that Shadow continues to hold firm for his fourth studio album, The Less You Know, The Better, which drops in September. At the time of writing only a fragment was available for preview: lead single I Gotta Rokk, a lumbering, guitar-driven mosh monster best known for damaging dancefloors in its Shadowsphere incarnation, and its two B-sides; I’ve Been Trying, a soulful psych-folk number complete with wistful lyrics and Pink Floyd-style effects overdubs, and Def Surrounds Us, an experimental foray into dubstep featuring 8-bit bleeps, brutal bass waves and a collarbone-crushing snare drum. None are tracks likely to please fans of Endtroducing…, but that’s something that Shadow says he long ago made peace with. The new album may boast a press release replete with self-doodled characters cynically sniffing at attempts to market the record, and released on an imprint called The New Futility – Shadow’s comment on the devaluation of recorded music in the disposable download age – but the artist insists that he’s not bitter for having had what many would see as his one true musical moment. 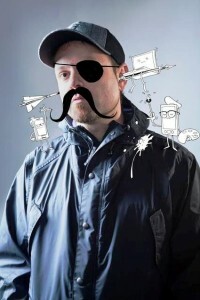 Nor is he deliberately trying to rile up his critics by making albums as far removed as possible from Endtroducing…. If anything, he says, he never knows what reaction his records are going to get. He recalls thinking that James Lavelle was going to hate Organ Donor and demand it be dropped from the record, and being pleasantly surprised to learn how well it had gone down in the Mo’ Wax offices.